Confession: I hate creating bulletin boards. I have two huge bulletin boards in the library that I change only once each school year--right at the beginning of the year. Whatever I put up there almost always stays there the entire year, so whatever I put has to be something low-maintenance that will be relevant for the entire year. I've done genre spotlights, weekly trivia, Returning Our Books On Time, Lone Star reading incentive photos and info, and our yearly cover awards nominees. This year, I am going to try something new on one of the boards. Back when Hollywood Video was still around (are they still around? Not here. ), I loved browsing the Staff Picks section. Same with Barnes & Noble's Staff Picks, which were offered at 40% off. So keeping with that tradition, I am doing a Student/Staff Picks board. I know the idea isn't new to many of you (I found a similar idea on Pinterest), it is new to me. Since I created my own template, I am offering it to anyone who wants to use it. I'm going to print these on colored cardstock for students to fill out for our board. The large blank space on the left side is where I will put the book's cover photo. The blue "Staff Pick" cards are for myself, our faculty, and our student library aides to recommend their books. 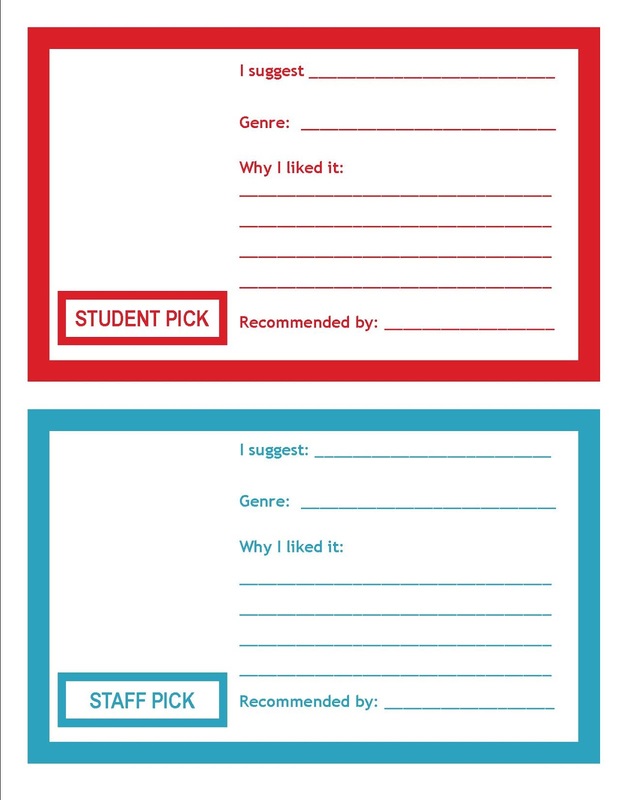 The red "Student Pick" cards will be for students to use. You could also use the space for a photo of the person recommending the book if you prefer. This is great! I'm going to use it during the first day of my college class! ARG! I cannot WAIT to start looking into my own school librarian degree! Your blog really keeps me going and helps me set my focus upon landing a job in a library! @Lyn Kaye--Comments like yours keep ME going! Best of luck to you with your library degree--it's amazing, wonderful, creative, and FUN. You'll love it!